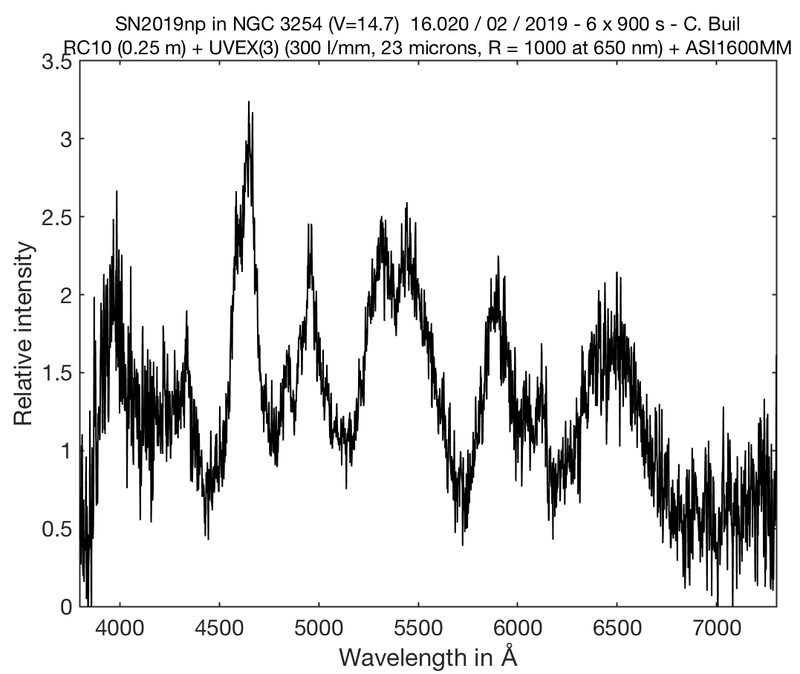 It is currently faint at mag 18 (right at my limit) but according to the published spectrum it is a type Ia, possibly caught a remarkable 2 weeks before maximum so based on the distance to NGC3254 and that from the spectrum there does not seem to be much redenning, it could reach ~mag 13. Last edited by Robin Leadbeater on Wed Feb 13, 2019 8:08 pm, edited 2 times in total. The moon was high and had to subtract lots of background (30 min exposures at -20C), but the features matching very well. There is only some shift in the H-alpha absorption . This SN is reported now at 13.7 mag (http://www.rochesterastronomy.org/snimages/), but since no obvious emission, had to produce good SNR at continuum level. The weather was good, but I was rather unsure when the clouds will come. Nevertheless, taken ref.stars 3 times (HD89744) as IR and response, so the response calibration quality should be good. Gelato says 100% SN Ia match, and enlists outstanding confidence with SN2003du (phase: -9.9d). I believe that my extra UV end here is real (except the last 1-2 pixels cutoff). 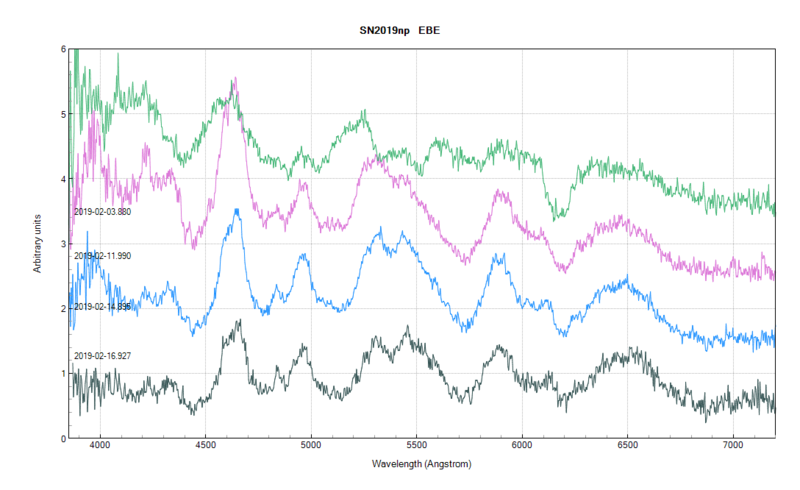 The are many match possibilities (seems the SN IA is more common), but the phase=14.9d is realistic. The object was low a bit, with some fog present. Hi all, the first spectrum of the year. I know... it's terrible! 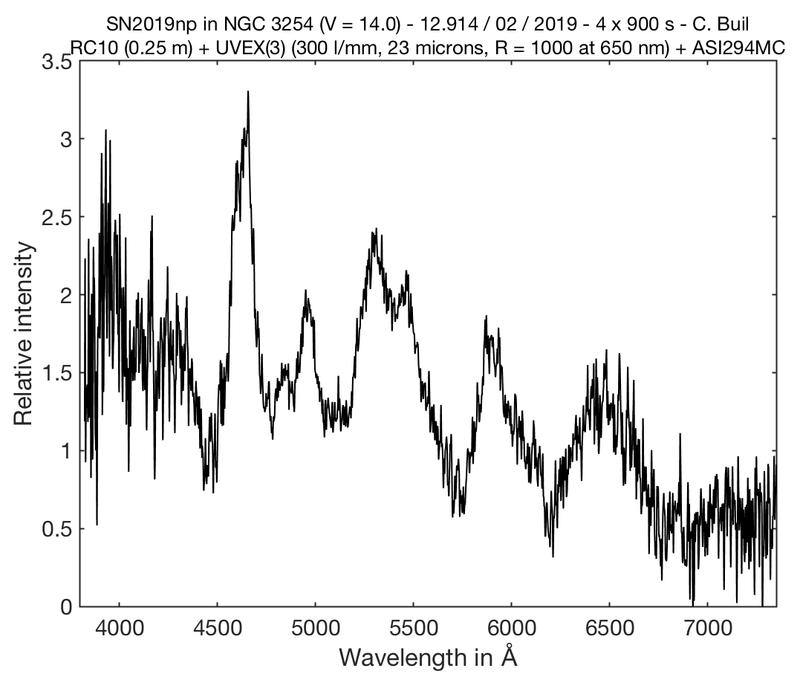 SN 2019np started to decline but it's still relatively bright. Fluxed with simultaneous photometry (Baader V filter, SHV-H9 CCD and AAVSO sequence) -> V mag = 13.82. The line identification is based on the paper here. SNID (Blondin and Tonry 2007, Ap.J. 666, 1024) returns the best match with Ia SN 1998bu at 11.4 days. Gelato (Harutyunyan et al. 2008, A&A 488, 383) found the same reference (SN 1998bu) but at 13.5 days. Just to experiment with, this is a single 960s spectrum with the SN in the large slit part (300 micron), the upper profile (offset) is filtered (converting resolution into SNR). Bravo pour vos spectres ! D = 17.43 Mpc soit 57 millions d'années-lumière. La distance donnée par la spectroscopie est de 17.43 Mpc. 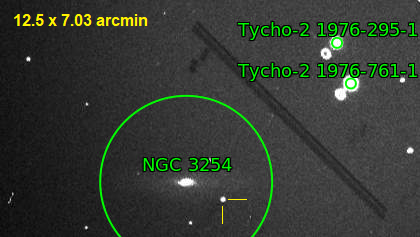 La taille de NGC3254 fait donc 0.0014 x 17.43 = 0.0024402 Mpc, soit 80 000 AL.